Sweet roasted butternut squash, earthy chestnuts and tender kale veiled in a luscious creamy coconut sauce. This satisfying veggie curry is sure to become a new family favourite! Vegan, GF & healthy. Preheat the oven to 180°c fan/200°c/400°f. Peel, deseed and chop the butternut squash into 3cm chunks and place them on a baking tray. Drizzle the squash with 1 tbsp of olive oil and a generous pinch of salt and pepper. Give everything a mix then roast in the oven for 35 minutes or until tender. Meanwhile heat the remaining olive oil in a large saucepan over a medium heat and add the onion and ginger to fry for 5 minutes, stirring occasionally, until slightly caramelised and soft. Add the garlic and spice mix and continue to fry for another 2 minutes or until the spices release their fragrance. Add the vegetable stock and creamed coconut into the pan. Stir until the cream coconut has melted then bring the pan to the boil. Reduce the heat to low and simmer for 10-15 minutes or until the sauce has reduced by a 3rd. Transfer the reduced sauce into blender and add 1/4 of the roasted butternut squash. Blend until smooth then return the sauce back into the pan. Add the remaining butternut squash, white wine vinegar, tamari/soy sauce, honey/maple syrup, chestnuts and kale into the pan and bring to a simmer. Cook for 5-10 minutes or until the kale is tender. If you find your sauce has become a little thick here, you can stir in a splash of water. To serve, ladle the piping hot curry over brown rice and top with a sprinkle of coriander and toasted cashew nuts. 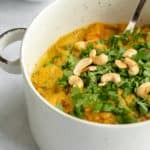 Leftovers of this butternut squash curry will keep well in the fridge for up to 3 days or in the freezer for up to 3 months. Just allow the curry to cool completely before storing in an airtight container. You can of course roast and peel the chestnuts yourself, but for ease I love and would recommend these ones. I love to serve this curry alongside a pot of chilli flakes for people to adjust the spice themselves. If you are extra sensitive to heat I would start with only a 1/2 tsp of chilli flakes in the spice mix and go from there. Gluten Free: Assure your vegetable stock is certified GF and use tamari rather than soy sauce. Vegan: Use maple syrup rather than honey. To make my vegetable stock I use 1 stock cube dissolved in boiling water. Personally I like the Kallo Very Low Salt Stock Cubes as they do not contain any added flavourings or preservatives. If you would prefer to use coconut milk instead of creamed coconut, you can do this by substituting the creamed coconut with a 400ml tin of coconut milk and using only 100ml of vegetable stock.